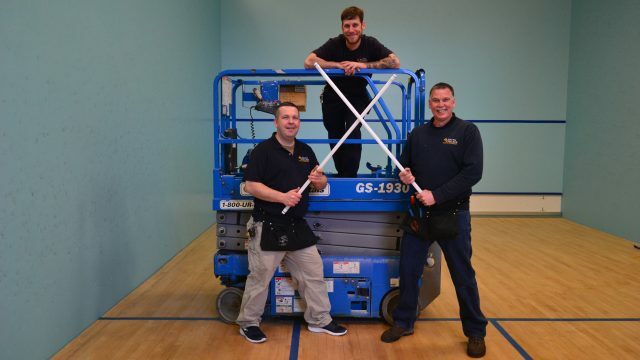 The new lighting upgrade in three buildings will change fluorescent tubes to energy-efficient LED bulbs. The upgrade will generate an estimated $34,000 in cost avoidance. The Big Ten beat 36 other athletic conferences to become the Conference Champion in the 2016-2017 College and University Green Power Challenge. 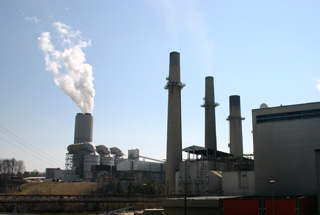 Procuring nearly 246 million kilowatt-hours of green power annually, the University of Tennessee, Knoxville was recognized as the top individual green power user in the challenge. Dartmouth’s president has announced new principles, standards and commitments in the areas of energy, waste and materials, water, food, transportation, and landscape and ecology. Based on a report developed by the Sustainability Task Force, these commitments include a goal of reducing greenhouse gas emissions from campus operations by 50 percent by 2025, and by 80 percent by 2050. Since mid-February, 324 panels on Clemons Library's roof have been producing what will amount to about 199,600 kilowatt hours of electricity per year. 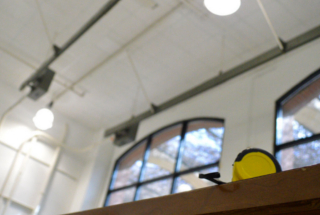 This will account for about 15 percent of the library’s annual electricity usage. The school's Board of Governors approved a $74.5 million upgrade to the university’s cogeneration plants, one built in 1995 and the other in 1987, to generate more electricity while producing fewer emissions. Between the two facilities, six turbines will be replaced and a total of $5.86 million per year will be avoided. Earlier this month, the Hillel House on campus became the first building on the university's campus to begin using solar panels as its primary source of energy. 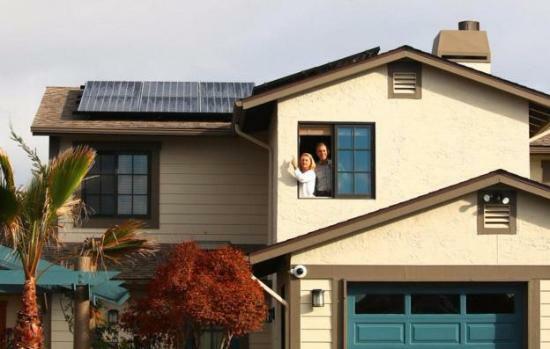 The system is projected to provide approximately 90 percent of the house's annual electricity. 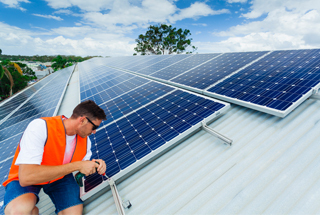 A new photovoltaic array will supply electricity to a old house that was converted into a classroom and multi-purpose room. The building was selected as a location for the project because of the roof’s orientation, its visibility from ground level and because it could become an energy neutral or near-energy neutral building with the panels. 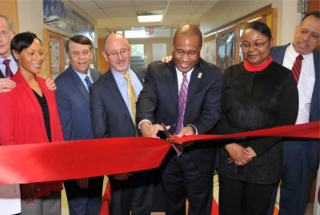 The project was initiated by students and will be funded through the Student Sustainability Fund. Building on a memorandum of understanding signed by the university and Mexico, Mexico officially launched a request for proposals that will award up to $10 million (200 million pesos) to support energy efficiency research projects in Mexico, led by Mexican research institutions in collaboration with University of California researchers. The request for proposals aims to further advance shared goals of increasing energy efficiency in buildings and cities by investing in demonstration projects and microgrids. 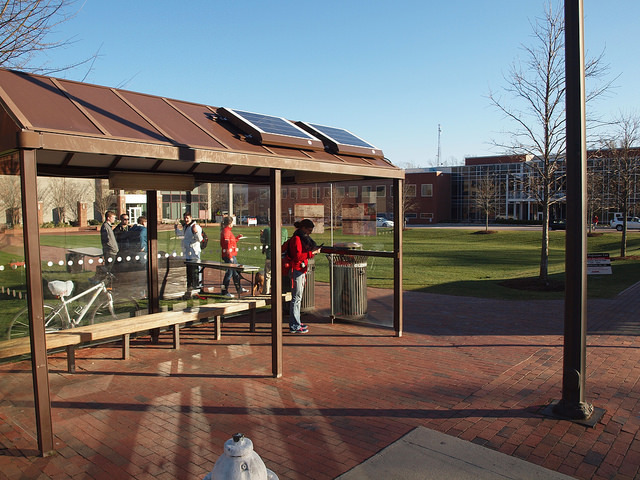 The university recently installed a solar canopy at one of its bus stations that allows riders to charge their electronic devices while waiting. The bus stop location as an optimal site for solar due to its popularity and lack of solar obstruction. The new 16,800-square-foot building houses 35 offices and four conference rooms and was designed to produce as much energy as it consumes, aided by daylighting, ground-source heating and cooling, and photovoltaic energy. It will use about one-fifth the energy of the average office building in that region's climate. The campus community can now use outdoor, clean-power charging stations, which were funded and installed after a second-year student wrote a proposal to the UT Student Green Fund for exterior tables with solar panel umbrellas. (Germany): Topped with a green roof and powered by renewable energy, the light-filled building will operate at zero emissions. It also includes a gray water system. The building exceeds the standard that sets energy requirements for new buildings in Germany. 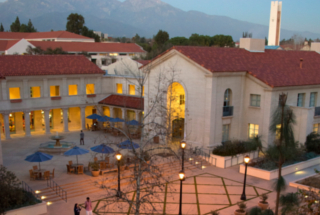 A new $2.5 million California Energy Commission grant will fund a three-year project to enhance existing energy management systems for 10 campus buildings. In partnership with five other organizations, the grant will provide additional occupancy sensors, automated controls, and optimization of air circulation, lights and thermostats. New LED light fixtures now provide light for the senior design lab of the university's Textile Engineering, Chemistry and Science program, replacing 84 metal halide and fluorescent fixtures. With new fixtures and occupancy motion sensors installed, the retrofit project is expected to save $4,700 annually in avoided energy costs, providing a return on investment in less than six years. Construction has started on a new solar array project at five different parking lots across campus that are estimated to generate more than 15,000 megawatt-hours annually, about 5 percent of the electricity used on campus annually. 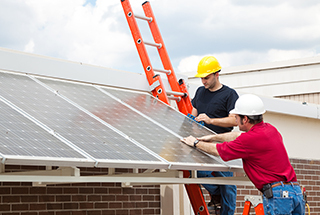 As part of the power purchase agreement, the university will purchase electricity produced from the solar arrays at a fixed price for 25 years. The university is covering the cost of connecting the arrays to the university’s power grid while project investors are paying all other construction and maintenance costs projected to be about $20 million. 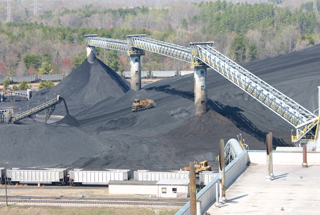 (U.K.): The university's board of trustees has agreed to end investment in companies that derive more than five per cent of turnover from the extraction of thermal coal or oil and gas from tar sands by January 2018, and actively manage other areas of its portfolio of energy investments, including those in oil and gas, to achieve a material reduction in carbon emissions from these investments. This will include investing in companies at the leading edge of carbon management and in companies with strong, deliverable commitments to improving their carbon efficiency, as well as a greater investment focus on non-fossil fuel energy providers. 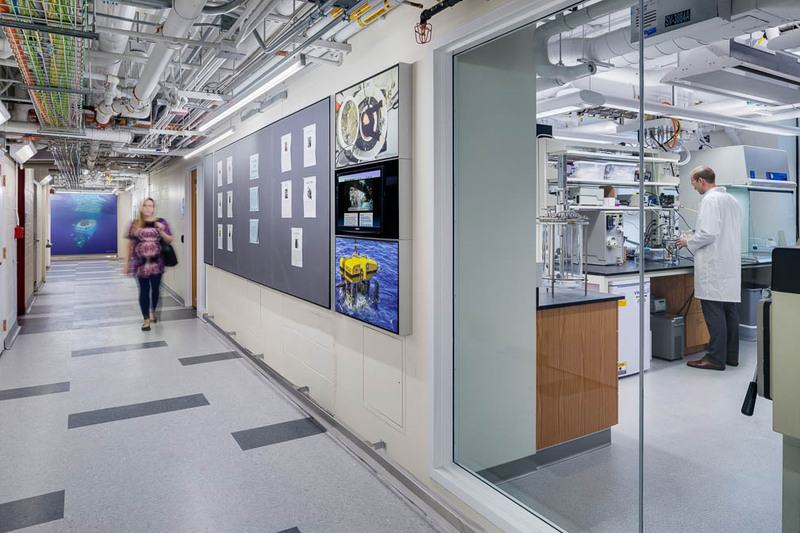 Over 90 percent of occupied space within the 6,415-square-foot laboratory renovation was designed with access to daylight and views. Additionally, 39 percent of materials used were manufactured locally and 80 percent of construction waste was diverted from landfills. 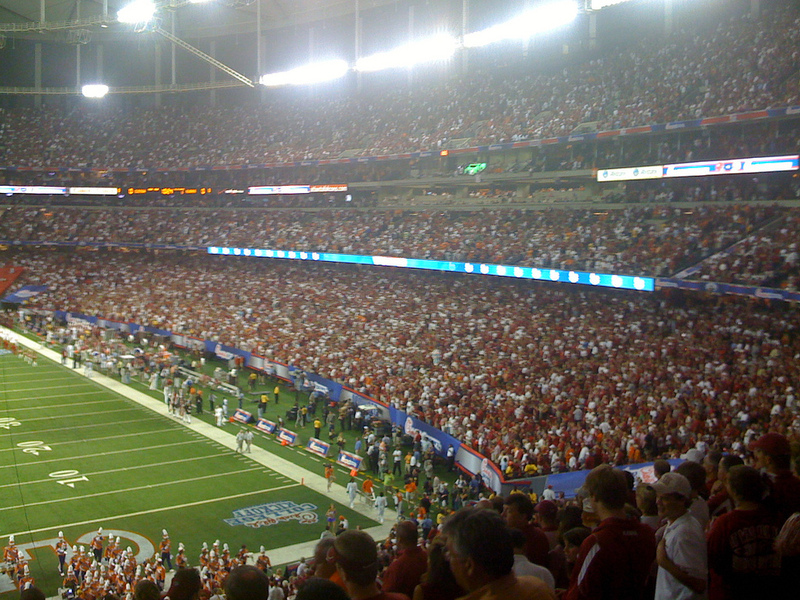 Overall, the space is projected to use 13 percent less lighting power. Over the 2015-16 academic year, Facilities Management and Development staff partnered with faculty and students in the college’s City and Regional Planning Department to create the university's first climate action plan. 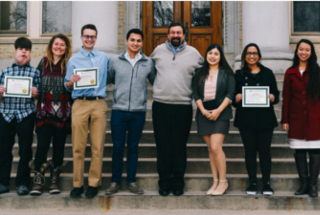 A team of twenty seven students and professors performed a background report and vulnerability assessment, comprehensive transportation survey, greenhouse gas inventory, and wrote the climate action plan. 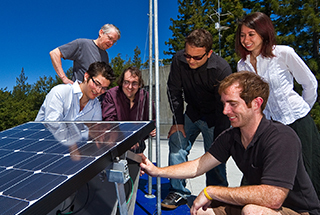 The university has the goal to achieve net zero emissions from all sources by 2050. Five Harvard Schools will share about $1 million, awarded by the Climate Change Solutions Fund, for seven projects. Topics include energy, decarbonization, air pollution, imagining a fossil-free future, healthy eating and reducing the environmental footprint of food, and policies that reduce greenhouse gas emissions in order to inform the 23rd annual United Nations Framework Convention on Climate Change meeting of the parties in November. The building features salvaged existing materials and energy-efficient lighting, improved HVAC systems and water-saving fixtures. 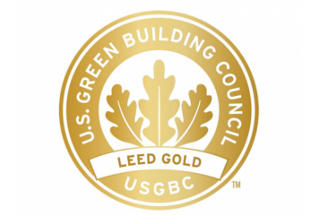 The project also used building materials with low or no volatile organic compounds and Forest Stewardship Council-certified forest products, and recycled more than 90 percent of construction waste. The university recently purchased 3,835 renewable energy credits (RECs) for $1,800, which is 0.02 percent of the overall electricity bill. This offset 3 percent of institution-wide electricity use from fiscal year 2016. 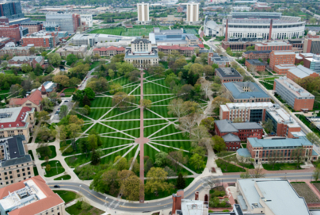 The purchase, which came about as a recommendation of the UM Energy Committee, allows the university to lower its carbon footprint, support the development of renewable energy technologies and practice resource stewardship. The university's Grounds Shop has switched to all-electric equipment, such as blowers and hedge trimmers, in an effort to reduce carbon emissions on campus. Making the transition to electric, energy-efficient equipment will reduce fuel consumption and gas emissions, increase air quality, benefit employees’ health and reduce noise on campus. The university's president signed Second Nature's Climate Commitment about one year ago, a pledge to make the campus climate neutral by the year 2040. On March 2, the college began construction on a new, 40,000-square-foot residence hall designed to meet LEED for Homes standards, and is expected to achieve Platinum rating. 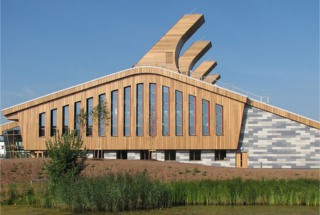 Energy-efficient exterior walls and roof, high-efficiency windows and connection to the central energy plant are among the many features that help reduce carbon emissions. Additionally, an upgraded stormwater-management system, including a rain garden, will minimize impacts to the existing community systems. The new five-story, $137 million building houses 500 students, faculty and staff and features a high energy efficient building envelope, operable windows, and natural daylighting and sun shades. 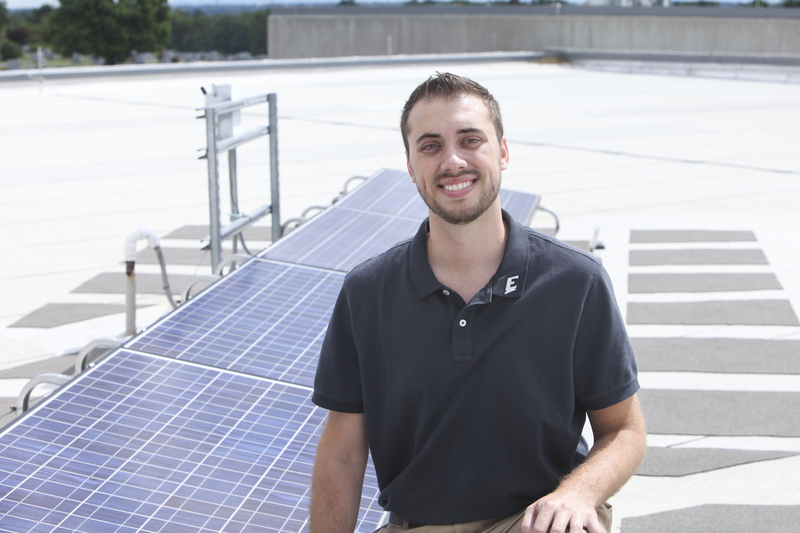 The university has embarked on a project with the U.S. Department of Energy’s Pacific Northwest National Laboratory to test software that can automate energy use of buildings on its campus. The project will tap into an existing 1-megawatt solar array on the campus and add battery storage to the system so solar power can be stored. The university and a local utility company recently partnered to begin a new program offering free energy efficiency assessments for local rental properties. Working through the Office of Sustainability, trained students are sent out in pairs to assess local rental properties using the U.S. Department of Energy’s Home Energy Score to rate the home’s energy efficiency. 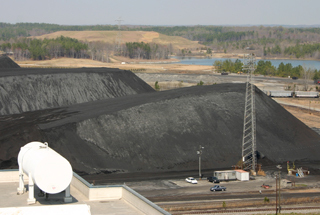 Increasing its use of biomass and other renewable energy sources, the university has teamed up with industry experts to develop diverse fuel sources and to optimize the power plant’s handling and combustion of these new alternative fuels in order to eliminate the use of coal by 2025. The current biomass fuel portfolio includes oat hulls, Miscanthus grass and wood chips. The university recently completed a comprehensive Climate Action and Resiliency Plan to strategically and economically reduce its carbon footprint to zero by 2036. 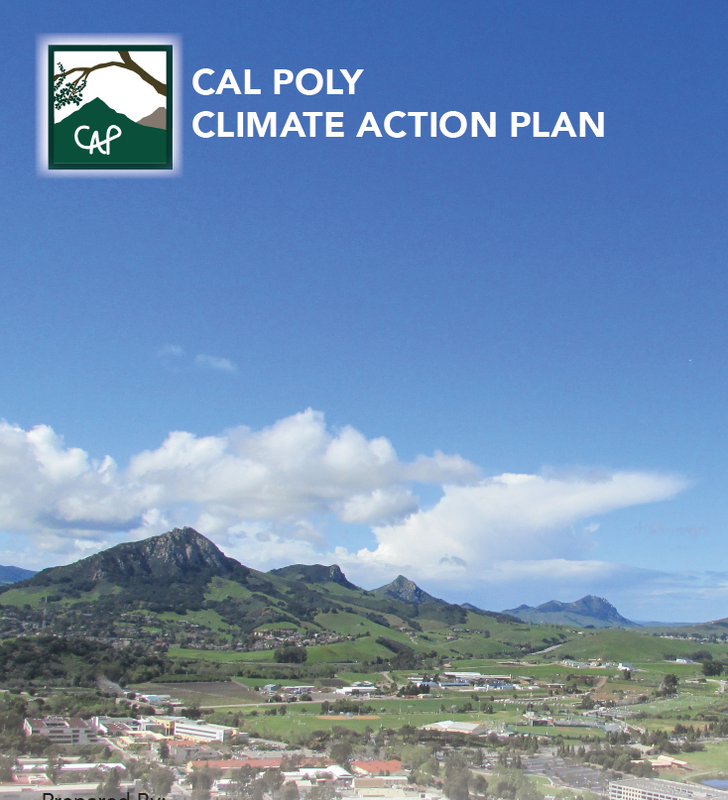 The plan calls for the university to reach its goal via a variety of mitigation strategies, including implementation of geothermal heating/cooling throughout campus, improvements in central plant and building efficiencies, greater efficiencies in steam and chilled water, energy efficiency guidelines for new buildings, the purchase of renewable energy credits and carbon offsets and reduction in water consumption. The new center will help increase access to clean energy and advance the state’s goal to get 25 percent of its electricity from renewable sources by 2025. The center will work to establish the state’s baseline of renewable energy literacy and usage, improve the infrastructure and capacity of renewable energy education, research and extension, and offer certificate programs and credentialing services in renewable energy. (U.K.) After hitting a 35 percent reduction from a 2008-09 baseline, the university announced a new carbon reduction goal–45 percent by the 2020-21 academic year. To date, more than 4 million pounds ($4.9 million) has been invested into projects to improve energy performance, the savings from which will be reinvested back into sustainability initiatives. In addition, plans are already underway to reduce water consumption by 10 percent. 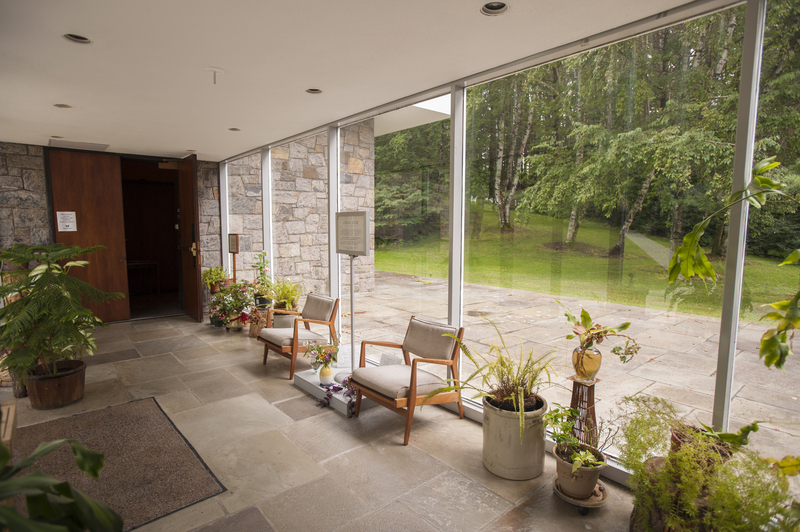 The building is co-located near public transportation, and uses light-colored concrete to reflect light, and stormwater retention and filtering. By weight, the materials used in construction have 32 percent recycled content, and by cost, more than 55 percent came from within 500 miles. Eleven faculty and staff homeowners of campus housing worked with Campus Planning and Development to install solar-electric systems on their roof that went live at the end of January. This summer, the university installed a ground source heating and cooling system to help reduce dependence on fossil fuels and achieve carbon neutrality by 2019. The $150,000 project will pay for itself in seven years and is anticipated to save the university more than $650,000 over the course of its lifetime. The university president recently signed a pledge committing the university to be powered from 100 percent renewable electricity by 2030, after more than 4,300 students, faculty and staff had signed a petition encouraging the university to consider the pledge. The university says that the decision to invest in renewable energy is due to the projected increase in energy prices over the next 20 years. Under the a Canadian federal government investment fund, the college will receive more than $4.75 million for two projects, and it will match the funding, for a total investment of $9.5 million that it is allocating toward upgrades to the campus, and training and research opportunities focused on alternative energy production processes. 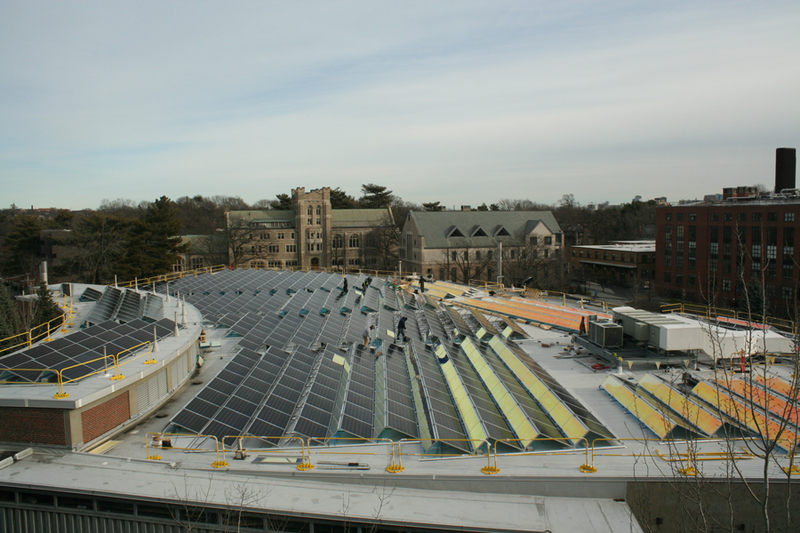 The three new solar-electric arrays will help the university reduce greenhouse gas emissions by approximately 1,830 metric tons and, combined with two previously installed solar projects, will provide around seven percent of the university's electricity needs. The university's energy management coordinator organized awards totaling more than $1.4 million for four energy projects: a solar energy storage system, thermal blankets to wrap heating piping in the mechanical rooms of buildings across campus to conserve energy and reduce heat loss, LED lighting upgrades and implement a summer demand response program. The greenhouse at the university will soon have a new biomass boiler from Germany that will replace the greenhouse's current propane gas fuel, resulting in fewer carbon-dioxide emissions. The boiler will use perennial grasses grown on the farm. 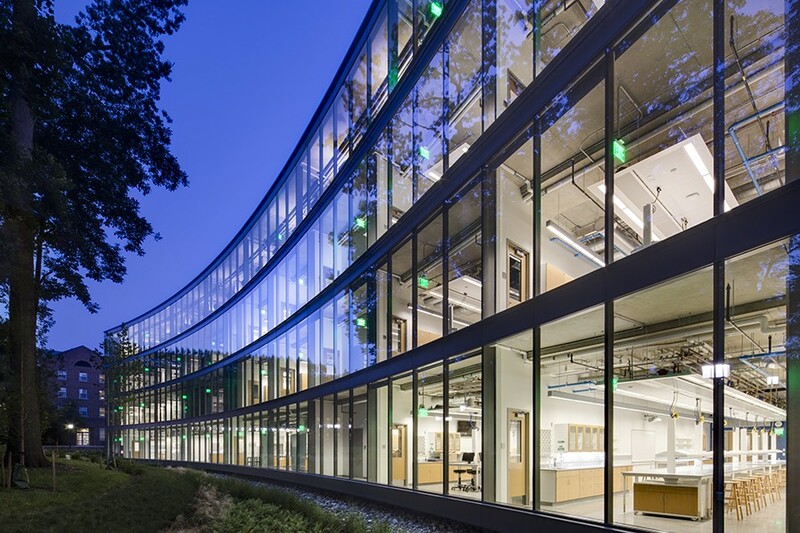 The Undergraduate Teaching Laboratories was designed to use 40 percent less energy than similar lab buildings. Its designs include highly efficient heating and cooling systems, occupancy sensors that control lights and HVAC, low-flow water fixtures and lab technologies designed to conserve energy and water. 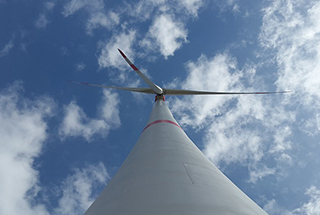 The college partnered with Bluestem Energy Solutions and the City of Hastings, Nebraska, to complete a 1.7 megawatt wind turbine on the college's Hastings campus. The wind turbine is owned and operated by Bluestem, although the college will claim a portion of the environmental attributes generated by the project. The turbine is slated to be part of the college's alternative energy program in fall 2017.